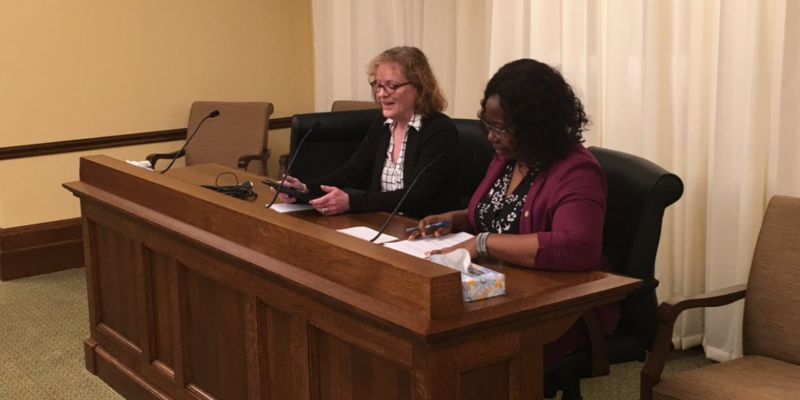 On March 14, the Minnesota House held a hearing on eliminating the use of suspensions and expulsions in pre-k programs, House File 1785. E4E Minnesota member Amy Eelkema, a 20-year special education teacher and now a consultant for St. Paul Public Schools, shared her insights as a veteran teacher on the negative impacts of push-out practices with our youngest learners, and the importance of embracing alternatives to suspensions and expulsions. Hello Mr. Chair and members, my name is Amy Eelkema Baxter and I’m here today as a 20 Year Special Education Teacher for SPPS and now as a Special Education Consultant mentoring and supporting the first year Special Education Teachers in St. Paul. I am also an executive member of the Special Education Advisory Council and a member on the Ramsey County Individuals with Developmental Disabilities Advisory Council. What do you do as a parent when your child is acting up at home? What is your response -- send them to their room and ignore them? Or, do you help them figure out what they need -- by teaching strategies for calming and soothing themselves and instilling in them the message that they are valued and important. I want to share a story about one of my students, a young black special education male who had a long history of dismissals and suspensions due to acting out behaviors - or as I like to call it - not getting his needs met. From the very beginning of his school career he was labeled as a bad kid, institutionalized as “other”, and as we all know when you are told something often enough you start to believe it. He had learned that acting out was the easiest way to avoid difficult and uncomfortable situations. You could see that he was missing some real foundational academic skills as well as relationship and problem-solving skills with his peers due to his repeated suspensions and dismissals. I decided to make this student my number one priority. What became clear very quickly was that this young student, with a history of dismissals and suspensions due to acting out behaviors, was actually a marshmallow, craving attention and melting into anyone who would give him an ear and a chance. The more he felt valued and listened to, the more engaged he became with his learning, academically as well as socially/emotionally. Furthermore, when he was able to internalize the message that he was an integral part of our classroom community his occurrences of absences and tardies also decreased. As a matter of fact, this is when he started to hold me accountable for my schedule. Because of our growing relationship due to his increased time in school, I had to inform him ahead of time about any meetings or trainings that would take me out of the classroom. The only way that we as educators can give our students what they need - a Free and Appropriate Public Education, the basic tenets of IDEA, is to actually have them physically in the classroom. Nationally, Black students are suspended at a rate of 3 times more often than white students. In Minnesota that disparity becomes 8 times more often. Nationally, Pre-K students are 3 times more likely to be suspended than K-12 students. Black pre-K students represented 18 percent of public preschool enrollment, but 48 percent of preschoolers receiving multiple out of school suspensions. We do not track or report pre-K suspensions in MN but given our sharp disparities in K-12 that are nearly 3 times worse than the national average, it’s clear we have a problem and have a well-built pre-K to prison pipeline that we must dismantle. This bill is an important step in that direction.